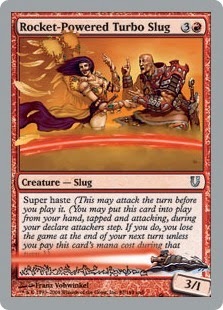 Monday Morning Magic (The Gathering): Fun Fact Fridays: What do a slug and the pact cycle (from Future Sight) have in common? Fun Fact Fridays: What do a slug and the pact cycle (from Future Sight) have in common? 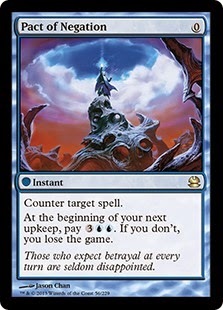 The un-sets lead to many innovations in Magic, though a single mechanic on one single card from unhinged lead to the creation of 5 instants. As you may now understand, the pact cycle was inspired by Rocket-Powered Turbo Slug (RPTS). The super haste mechanic while not on any creatures so far (most likely because it would be broken) it did lead to a well designed series of instants that were not by definition "bad".